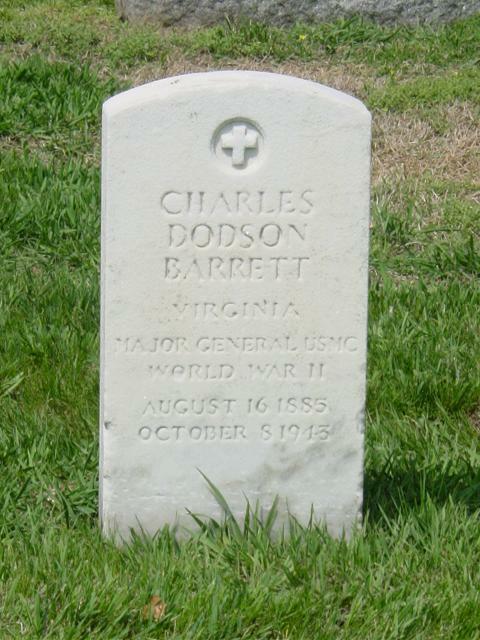 Major General Charles Dodson Barrett, the first Commanding General of the 3d Marine Division, was awarded the Distinguished Service Medal posthumously in recognition of his outstanding service during World War II. He was killed accidentally while on duty in the South Pacific, 8 October 1943. General Barrett was born 16 August 1885, at Henderson, Kentucky. He graduated from high school in Alexandria, Virginia, and was commissioned a Marine Second Lieutenant on 11 August 1909. He was assigned duty at the Marine Officers School, Port Royal, South Carolina, the following month. In January 1911, he began a few months duty at the Marine Barracks, Boston, Massachusetts, and was detached on 23 May to report to the U.S. Naval Academy, Annapolis, Maryland, to command the Marine detachment aboard the USS Indiana. On 3 September of that year he transferred to the USS New Jersey. The General landed with the detachment of the USS New Jersey at Vera Cruz, Mexico, on 22 April 1914, and participated in the capture of that city. He was detached from that ship 13 December to the Marine Barracks, Norfolk, Virginia. His World War I duty included detached service with the U.S. Army in France from 25 September 1918. He participated in the Meuse-Argonne Offensive of November 1-3, of that year, and in the spring of 1919 was in command of the 2d Battalion, 367th Infantry at LeMans, France. Detached in April, he reported to the Commanding General, 4th Brigade, Marines, at Nieder Bieber, Germany, and was detailed as Adjutant from 11 April. He arrived back in the United States 3 August 1919. From 1921-1922, General Barrett served in Santo Domingo and from 1924-27 was a member of the American Battle Monuments Commission, Washington, D.C. He then returned to France to study at the Ecole de Guerre in Paris, and from 1929-33 served as an instructor at the Marine Corps Schools, Quantico, Virginia. During the next two years, he was assigned to the Division of Operations and Training, Headquarters Marine Corps, Washington, and from 1935-36 served aboard ship as Division Marine Officer of Battleship Division 4, U.S. Battle Force. Upon completion of sea duty with the Battle Force, the general spent two and one-half years in the War Plans Section, Office of the Chief of Naval Operations, Washington, D.C.; and from August 1939 to June 1940, commanded the 5th Marines, 1st Marine Brigade, Fleet Marine Force. He returned to Headquarters, Washington, in July 1940, serving first as Director of the Division of Plans and Policies. Later, he served as Assistant to the Commandant of the Marine Corps, Lieutenant General Thomas Holcomb, from November 1941 to March 1942. In March 1942, General Barrett assumed command of the 3d Marine Brigade, and the following month embarked with the Brigade for Samoa, where he welded his command into a fighting unit. He was ordered to the United States in September 1942 to assume command of the 3d Marine Division, then being organized at Camp Elliott, San Diego, California, and was promoted to major general on assuming this command. Early in 1943, he embarked with elements of the 3d Marine Division for Auckland, New Zealand. By August 1943, he had all the major units of his division stationed on Guadalcanal, training intensively for the Bougainville operation. On 15 September 1943, General Barrett relinquished command of the 3d Marine Division and assumed duties as Commanding General of the First Marine Amphibious Corps, with headquarters on Noumea, New Caledonia. In this capacity, he continued with the planning for the assault on Bougainville until his death three weeks later. Accidentally injured following a cerebral hemorrhage, he died 8 October 1943 at the base hospital and was buried in the American cemetery there. Following the war, he was reinterred in Arlington National Cemetery. "For exceptionally meritorious service to the Government of the United States in a duty of great responsibility as Assistant Commandant of the United States Marine Corps; Commanding General of the Third Marine Brigade; Commanding General of the Third Marine Division; and as Commanding General of the First Marine Amphibious Corps, prior to and during operations against enemy Japanese forces in the South Pacific Area, from 7 December 1941 to 8 October 1943. "Assigned command of the Third Marine Brigade in March 1942, Major General Barrett welded this command into a superb fighting unit, advancing his forces to the shores of Western Samoa and organizing positions on Upolu and Savaili Islands. In conjunction with Naval Units stationed on the islands, he established important air and Naval facilities necessary to strengthen the chain of islands across the South Pacific and protect the vital line of communications to Australia. "Returning to the United States in September 1942, to take command of the Third Marine Division, he developed a powerful striking force which was later to blast the enemy from his strongholds on Bougainville, Guam and Iwo Jima and thus pave the way for ultimate victory over the Japanese. Relieving the Commanding General of the First Marine Amphibious Corps on 15 September 1943, Major General Barrett, from his Headquarters on Noumea, New Caledonia, aided in formulating stragegical plans for the assault on Bougainville which was to end enemy opposition to the important development of the Empress Augusta Bay Area as an Allied Airbase and to advance United States control nearer to the shores of the Japanese Homeland. Serving in this capacity until his death on 8 October 1943, Major General Barrett instilled in the officers and men under his command his own spirit of determination and, by his sharp military acumen, his forceful leadership and his indomitable courage, served as an inspiration to his gallant Marines in carrying the fight to the enemy. His conduct throughout reflects the highest credit on the United States Naval Service. He gallantly gave his life in the service of his country." In addition to the Distinguished Service Medal, General Barrett's medals and decorations include the Mexican Service Medal, Victory Medal with Meuse-Argonne clasp, Army of Occupation of Germany Medal, Expeditionary Medal (Santo Domingo), American Defense Service Medal with the Base clasp (Puerto Rico), Asiatic-Pacific Campaign Medal and the World War II Victory Medal. WASHINGTON, October 8, 1943 – Major General Charles D. Barrett of the Marines was killed accidentally while on duty in the South Pacific, the Navy reported today. Marine Corps Headquarters said that no details were available. Born in Henderson, Kentucky, he was appointed a Second Lieutenant in the Marine in August 1909, and attained the rank of Major General on August 26, 1942. 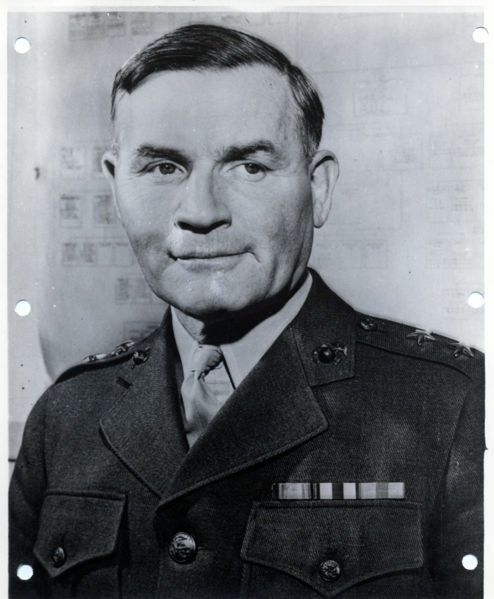 His assignments included duty as commander of the Fifth Marines, First Marine Brigade Fleet Marine Force from August1939 to June 1940, and a subsequent assignment as Director of the Division of Plans and Policies at Marine Headquarters.